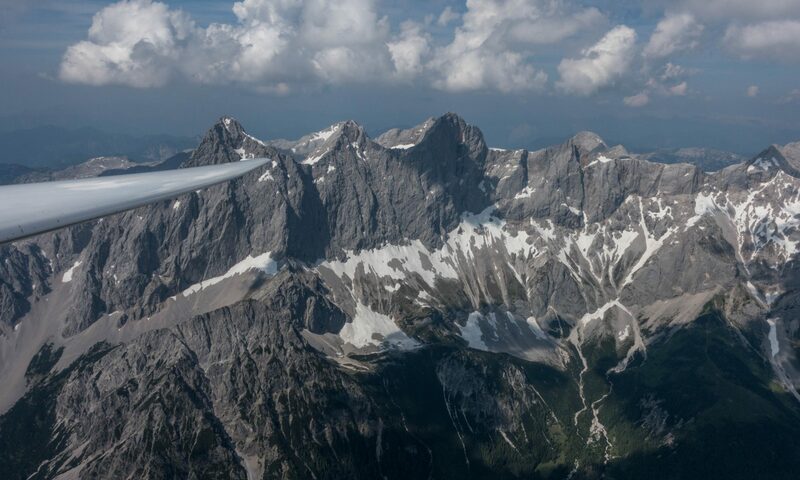 Because ridge lift depends first and foremost on the direction and strength of the wind (relative to the available terrain) we are mostly interested in a good wind forecast for the task area and the planned duration of our flight. Since I started to fly in 1983, wind forecasts have improved dramatically, largely thanks to the increase in computing power. Wind aloft forecasts are now quite reliable, sometimes even (but not always) for several days in advance. Nevertheless I always want to check the latest forecast in the morning before my flight as it is always the most accurate. I have also found that the higher the altitude, the more reliable the forecast. The wind at ground level is quite unpredictable and often wrong because there are many local factors at play that the wind model cannot incorporate. Usually I begin by starting at the overall soaring forecast and not specifically with the wind alone. E.g. I will look at sites like topmeteo and meteoblue, that are primarily designed for thermal flying and provide a lot more information than just the wind. Before considering a flight that depends to a significant degree on the availability of ridge lift, I will also use an interactive wind map. I particular like the one from windy.com. Is is free to use and you can register so the site will save your personal settings. The colors give you a quick sense of the wind strength and the little animated arrows point the direction. There’s a slider on the right that allows you to quickly adjust the altitude of the projection, and a slider at the bottom allows you to change the time of the forecast. It’s extremely simple to use and for a visual person like me it’s a terrific tool that tells me almost anything about the wind that I would want to know. In looking at the forecast you will want to pay particular attention at the wind around ridge top level and further below. In the ideal scenario, the forecast wind will blow at 10-20 kt directly at the ridges you want to use. Most often you will find that the direction differs considerably with altitude. Remember to consider this in your route planning! In addition to the wind you will obviously also want to check the overall weather, the approach of any frontal systems, the strength of any thermals, the risk of thunderstorms, etc. You will also want to know whether and at what levels you may be dealing with clouds. You can get a simple overview of low, medium, and high cloud coverage on windy.com (by selecting it from the menu on the right) but the forecasting tools that you use for thermal flying will tell you a lot more. You can also look at a few Skew-T charts for your area to gain a better understanding of the difference between the forecast temperature and the dew points at various altitudes. Finally, you will want to look at the stability profile of the air and the wind profile further aloft to determine the likelihood of a wave system developing above and behind the ridges. We have seen that waves triggered by lee slopes further upwind can amplify or destroy the lift at the slopes you want to use. Looking at the potential of wave in advance will make you prepared. It may also allow you to get into wave lift and go on a completely different flight than the one you had planned. Look at the section on flying in wave lift for more information.